“We’re letting those people in?” “There goes the neighborhood.” “Time to delete this app.” “I hope they don’t just talk about Android.” These are only a few of the comments I read when I noticed a post on the new Secret app, now available for all Android users through Google Play. As we saw when apps such as Instagram and QuizUp launch, a few users, typically iOS device owners, think that our low-end “cheap plastic” handsets will bring down their amazing exclusive communities. Well, I am here to tell you that we might. On Secret, users quickly sign up using an email and phone number (optional), then begin sharing secrets with friends that are found through your address book. If a secret is juicy enough, it could spread around the world thanks to the app’s “heart” button. Think of the heart as you would on Instagram. The more hearts a post acquires, the more people will see it. 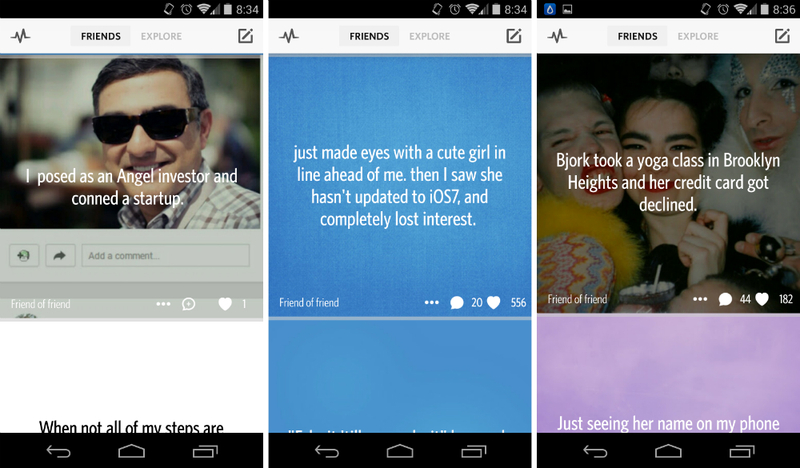 Users can customize their posts with pictures and colors, all while staying completely anonymous. Anonymity is the main goal. The one tiny bit of info you are given about the person posting is in the lower left-hand corner of cards where it will read “friend” or “friend-of-friend.” Other than that tiny bit of information, you will have no idea who are posting these secrets. While I personally am not much of a secrets guy, so don’t worry iOS owners I’m not here to ruin your good thing, but a few of you reading this may be. You can grab the application off of Google Play for completely free. Try it out and let me know what you think. I’m dying to know.